love this app but i have a request! i love his app so much!! could you guys add more characters? maybe when you do a person and you finish you could press finish and it adds it to a “gallery” in the app. then you could go back and look at every creation you made! i don’t like having to have pictures in my camera roll...they take up space. overall, i love this app!! I like this app a lot. But I just that there were a few more things to do on the hair like having hairspray to make the hair stick up in the air. This game is the best! I just need to find more time to play it. 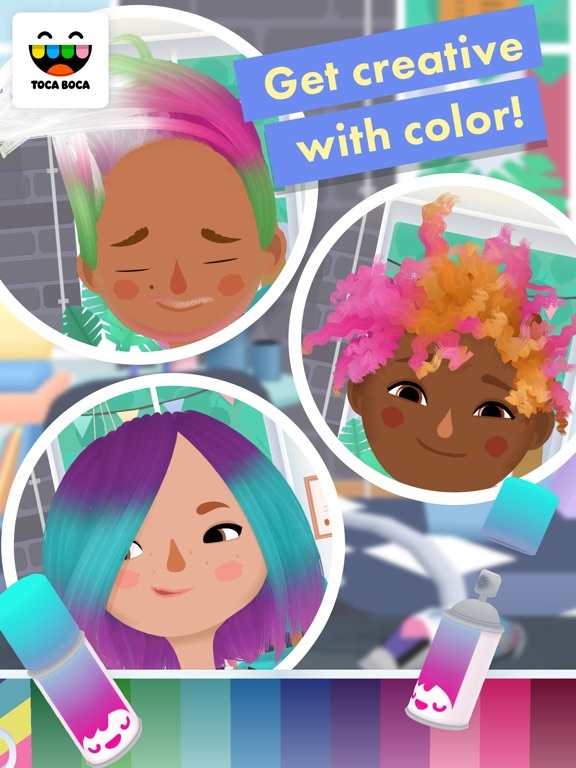 Toca boca hair salon 1 and 2 had awful and weird faces this 3rd hair salon is much better then the others so thx! Soo I’ve been playing Toca for about a year and I really like it a lot but I some ideas to make it even better! Number 1 make a button or option to make 2 braids instead of doing it the hard way! Number2 add new people cause it gets boring doing the same one over and over. Number 3 make styling the hair easier. Number 4 get the colors so when you dye it some color get messed up so make it neater. That’s all enjoy my review!!!! How do you undo braids ? From I was little I got all the Toca Boca games. The Santa hair cut, to a hair salon 1,2, and now 3!! I really enjoy playing there games in that there fun for all ages! I would love if they could add background music to this one. Still enjoy this game and will keep playing!! i got this app a few months ago. it is great if you don’t have wifi you can play it! but after awhile it does get a little boring. i think it would be fun if there was a mode where they ask you what they want! anyways good app overall! Every time my daughter is playing this game it crashes right when she’s trying to do something, she absolutely loves the game though it’s just always crashing on us. I’m older now but my little sis plays this so I got it it’s so fun but it would be great to be able to make a Minecraft themed hair style or a Minecraft shirt! It is so fun!! When I’m down I play this and it makes my day!!! I had to download this on every device I had because it is so fun!!! 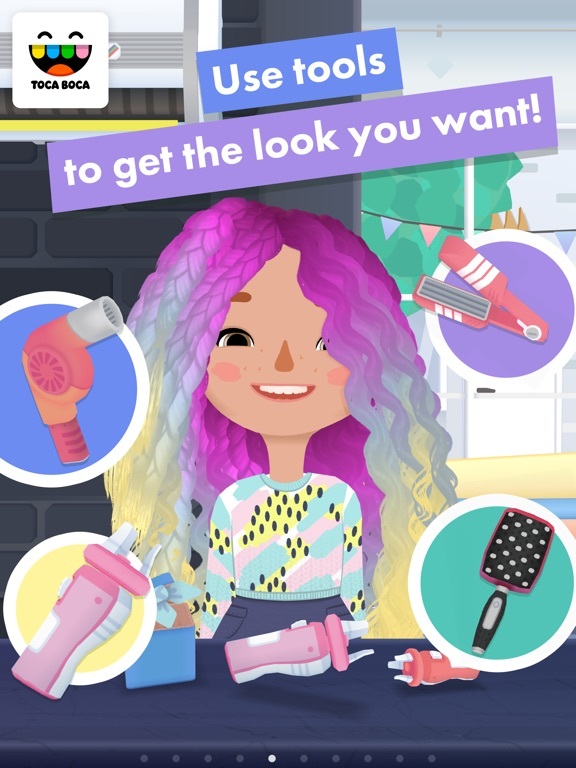 I love this game but anytime I use the smaller hair spray the app quits or makes my phone freeze. Please fix this! I like the app. I love playing this game but the only problem with it I have is that every time I take a picture of their hair it saves it to my camera roll.I don’t really like that because half of my camera roll was pictures of people from toca hair salon.It took up a lot of storage on my iPod and I was thinking that you could put a gallery inside the game with all your saved hairstyles instead of automatically saving it to camera roll.Otherwise it’s a great game! This game is very laggy and I can’t always finish my clients hair (in the game). Sometimes it takes me all the way out of the game and make start over again. Also, sometimes it pauses and then I have to close the app and then go back on again. The game is fun for the most part, but it needs to be fixed. I like styling the hair and dying it but it’s just the way it acts. Please fix your game!!! I play the game it’s ok but it won’t let me switch to the different categories I play on phone too. I think the this game is very educational and fun but what I wish that they could do is add more characters and different characters. It just kinda get boring with the same old people to do hair styles, but overall great app!! This game is fun because you have no challenges or anything like that! You can do anything you want. 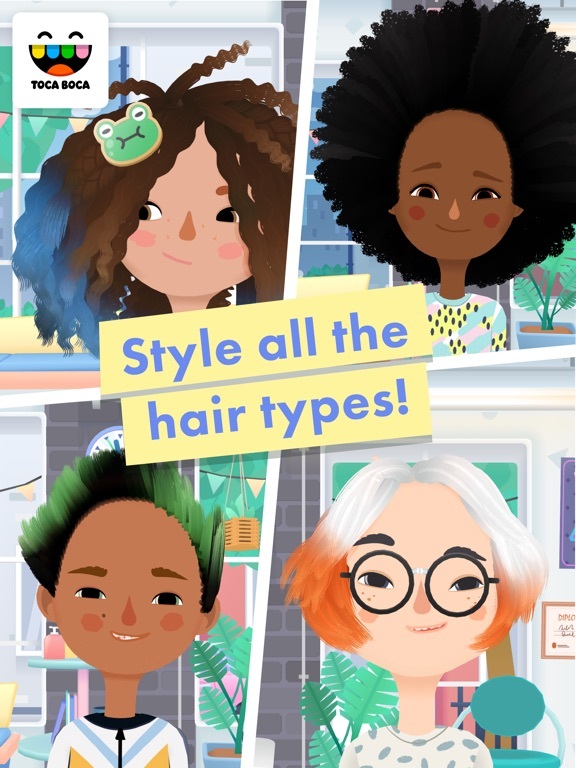 You can make up a story for each character or pretend that you own a hair salon and that’s the fun part about this game! I do however sometimes get the feeling that the characters are watching me through the camera, but that’s impossible because they would have to ask for permission to access your camera something I am pretty sure they don’t do. I love this app, but there’s a few problems. 1. If you had this for more than a week ( like me ) then you would get sick of it. When you play the app, it’s fun at first, but then after you’d for then a week, it would get boring, and that’s just not a fun app to play. 2. There hasn’t been a update on this app since I’ve had it. I know that the background has gotten an updated a few times, but this is different. Why haven’t the people, colors to die the hair, the materials, the clothes, just why hasn’t all that stuff ( and more ) been updated? 3. Why does this app cost $3.00 when the quality is awful? Why does this app even cost money? 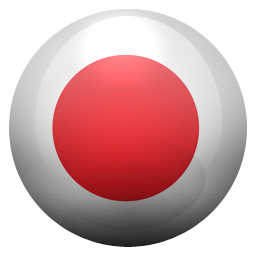 If I want an app and it cost $.10.00 I expect good quality, but this app is $3.00 and doesn’t have good reviews ( most of them ) or quality to it. Please these things about the app. 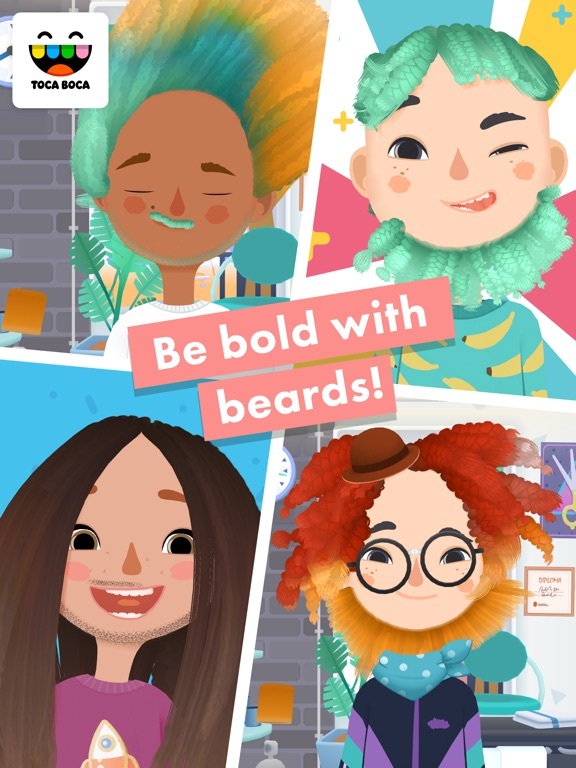 This app was just SOO amazing pls add more stuff like this it’s soo much fun I also love the valentines UPDATE 🥳🥰I CANT WAIT FOR THE NEXT TOCA APP!!!!!!!!!!!!!! This game is great and I enjoyed it a lot. But the one is that last year I did an update and it caused my phone to glitch and I eventually had to get a new phone. So don’t do any updates for this app. I payed money for this game. For some reason, whenever my 3 year old cousin and I go to dye the hair, it crashes. Usually about halfway through dying the hair. This is really annoying me because this is her favorite game, and she gets upset when it doesn’t work. Please fix this ASAP, it’s bugging me too because this game was not free. Love it, but needs more. every time i play this game it shuts down while i'm doing the hair, but overall it's a great game. I love this game,I love how smooth the hair looks and all the colors,but I wish there was a way to save the styles/looks/characters you’ve made,I hope you make an update of that in the future. My kids really love this and can be provided with many stuff! My oldest daughter ( which is 6 ) says she wants to work at a salon and know she can be taught by it! I love the app! The only problem is sometimes I pick someone and start making there hair and the screen blacks out and it shuts me out from the app and I have to start over. When I first got this game I loved it so so so much. I think I probably played it every single day. But then after a while, I started to loose ideas of hairstyles and when you get to choose a character at the start I would get duplicates so much. It just started to get boring but it’s still really good. I 100% recommend. I mean, I had it for like a year which is a pretty good amount of time with a game. This game keeps the kids busy, but now it doesn’t. Is there anyway that I can get my money back? Love this game so much, but when I playing a glitch always has to interrupt. I have to get of the app, clear my history , try again, and then it glitches again. Please fix this bug! I like the game, but none of the accessories fit, also the characters do not give good interactions as you can barely tell their reaction to the users actions. Next, I think that when you are done with a character and take a picture those should show up when the user is choosing a character to style. Overall,it has some issues that if they were solved would make it worth the $3.99. It’s gross. Inappropriate for children. I played the game but when I’m dying the hair it glitches out and I have to close the tab every time. I just want my money back, if it was a working game I wouldn’t complain but I just want my money back. It’s honestly not the best Toca boca app you have ever made.it’s still fun though . I payed 2.99 and personally I think it should be free . It is kinda boring. I just got this today and it was a great choice!! I definitely recommend this game to anyone who is trying to find a good way to spend money or just anyone in general 🥰 Great game I have no complaints! every time that i use the hair spray it GLITCHES!! and it’s annoying because i just bought this app for $4. minus that the app is fine. Oh my gosh, this game doesn’t allow you to turn the people around. 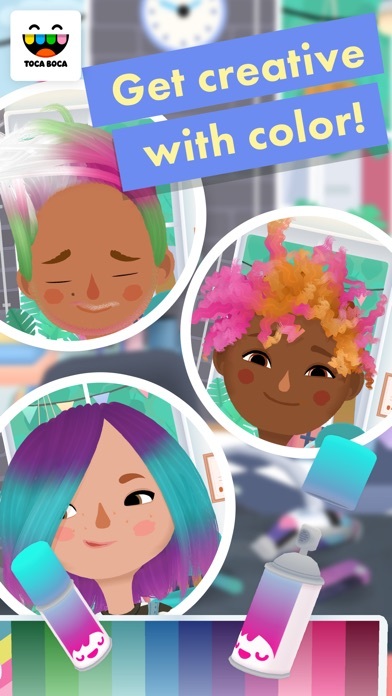 I find this absolutely horrendous, as this is a hair cutting game and you should be able to do just that. PLEASE add this feature and I shall raise my star review to five stars! I love this app but if I use it for more than two minutes it crashes. Every time I open the app. Please fix. I think this is an amazing app I spend hours on it but we have a problem I keep getting kicked out every time I use the tiny hair spray?! ?what is that about?!??! I really love this game I play every day when I get a chance. I have a suggestion, maybe we can try and turn the people around so we can see the back of their head. Also maybe there can be something like creative mode and that is like it is now (but you can turn them around) And next it can be called salon mode or something along those lines, the person can give us a brief note on what she or he wants and we do what's on the note, for example the note can say "I want my hair washed, bleached and dyed a blue ish vibrant color ,wavy, long but trimmed." And she or he rates us on how good we did from 1 to 10 and they pay us money. With the money we can maybe buy metallic hair colors or new clothes or something like that. Thank you for listening I hope you can use these ideas. I really love this game. It’s fun, and a boredom killer, but there are a few things. 1) It glitches once and a while, mostly while using the hairspray feature. 2) I wish that you could save the hairstyles that you create without having to save it to your camera roll. 3) I wish that the costumer would give me an idea of what they want as a haircut (length or specific colors.) And tell me how they like the haircut. 4) I’ve read some comments, so I know that a lot of people are saying this, but it would be nice if you could turn the person around to get to the back of their head. It would be easier to put their hair in a ponytail or bun which can be difficult at the moment. If these features were available, I think that this would be a more entertaining game. I love love love this app but I'd like to walk around in the background and be payed for doing haircuts so we can upgrade our salon. Like have the salon look really bad then we earn the money and sone you have a 5 star hair-salon! And maybe even higher an assistant! Well that you don't have to pay I'm a kid so I see parents buying this for there kids! 😃😃😊📱💻📱💵💵... By the way I have an idea about toca where You can start out like an open Field like mine craft and press a build button where you could create characters and build what ever you like with some characters from the other Games like those characters and some buildings from toca just like Minecraft and only sell for like 💵1.99 because that is very cheap for a good Game if you create it how I have texted it! I love this game I am glad my mom got it for me I would just like if you could move the characters like around and I want there to be other hair dressers in the backround working on other people I would like if there were like orders that you would have to do and then you would get paid for doing it and with the money you can build up your tools and upgrade them. One more thing. I would like you to lower the price down to like 1.99 or 0.99 you know something like that and I would like to have the customers move to other stations like you would be your own character and move the person to another thing and move them to the registers tysm for your time!! I love this app! It is so fun to play! 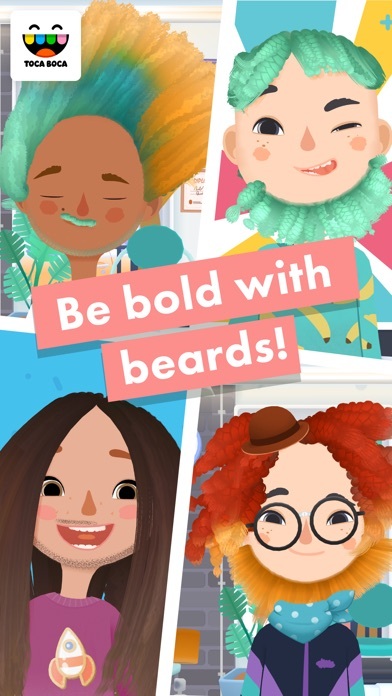 I love how now you can give all characters beards, the braiding tools, and the multiple-color hair color sprays. I also like all the backdrops for taking photos and how now you can change the clothes of the character. One thing I find annoying however, especially when putting in accessories, the characters move WAY too much, and it is difficult to get the accessory where you want it. Please fix this, it can get pretty annoying. Also, there should be a feature where we can put the hair in a ponytail. There can be different color hair ties and I think it would be a fun feature. Otherwise, this is a great game, it keeps kids busy, and I would highly reccomend. This app is amazing, but I have a suggestion. This app has so many great features that are so fun, but it would help if you could let us turn the person around so that we can get the back of their head. Also it would be great if the people could give orders and rate you or make an expression to show if they like it or not. And maybe with those ratings you could get coins to get more characters, clothing styles, etc. Another thing is that if you could braid the persons hair by yourself or make a fishtail braid or something like that would be amazing! Also if you could let us put the brain or ponytail over the shoulder for a picture that would be great! If you take these suggestions then that would be amazing! Best game I have ever played! I always resort to this entertaining app when boredom takes over. Customization is at its highest in Tica Hair Salon 3! I love how yoy can change outfits, hair color, and brushing or combing hair is much smoother in this game than any other hair salon I've played. Lag is never a problem! Everything is so smooth. I only have one key reccomendation; precision. This might just be because I play this game on my phone and there is a smaller screeb, but sometimes i will try to comb a piece of hair and it takes another piece I don't want it to eith it, which is quite a bit if a struggle. Nevermind that, I still adore this game. Keep up the spectacular work! Hi! I love your games. They are very fun to play. I have a few suggestions for a new game ideas. My first idea was called Toca world travel. You could travel to different games in previous Toca games and you could travel to different places around the world. This game would be very fun and it could have shopping centers malls airports animal shelters and cars that actually move. You could get onto a plane from the airport and choose a different game or a different location in the world to visit. It would be lots of fun to have this because it would be very fun to have a big houses and lots of pets and different ways to play. Thanks so much. 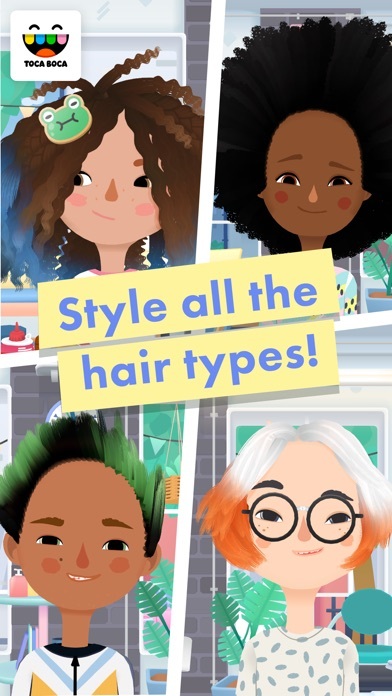 Toca hair salon three is a very amazing game! But I do have a few suggestions. 1: I think the picture feature is great! But maybe you could make your own backgrounds... It would give an exciting touch to this already amazing game. And just imagine it, creating your own background to make your world come alive! 2: I think there should be a mode where the character tells you what they want their hair to look like. I think this would give a new feeling to the game and while still having the normal mode you can keep kids interested. 3: That hair coloring option is a great ! But maybe in the hair coloring section there could be a feature where you can put patterns into your characters hair. Overall this is a very great game! These are only suggestions and none of these are criticisms of this amazing game! I would highly suggest this game for a younger audiences. If you were to put in the second mode this would be a great option for older kids as well. I am addicted to Toca Boca and Toca Life games. But................ 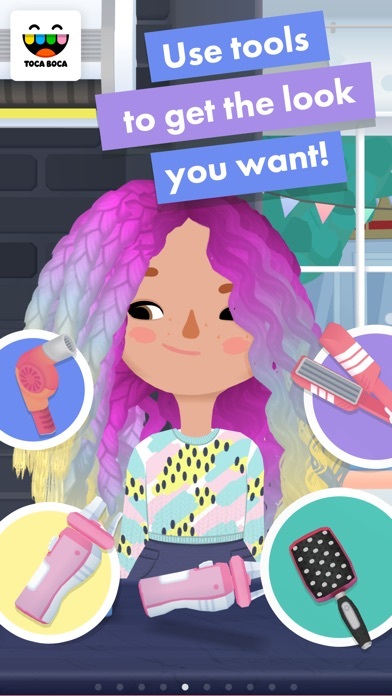 I really think u should make some new toca life games.#l: Toca Life: Spa; You can do makeup, nails, toes, hair, and chose their outfits. It could be for free or for $1.00. #2: Toca Life: Holiday’s; You can chose different holiday’s and then play. (Christmas=buy gifts, fly Santa around the world, see the different scenes from all the different toca life apps, open presents, have parties/go to parties, etc. 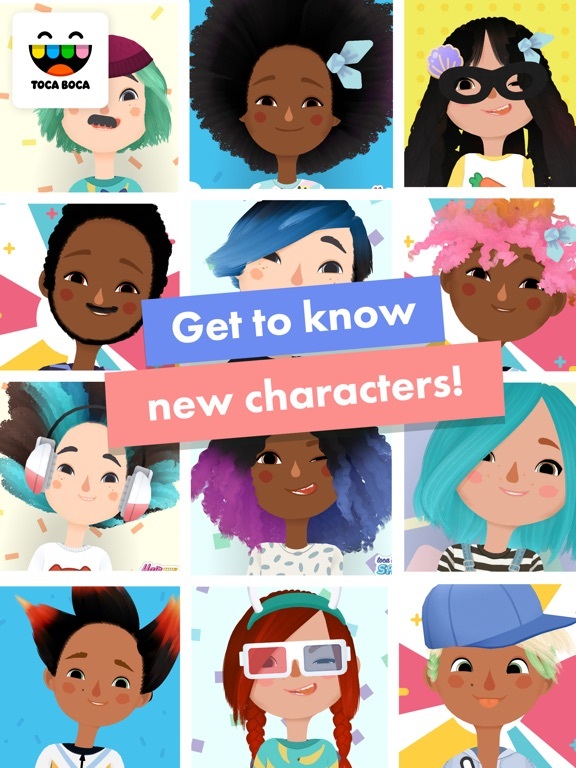 )#3: Toca Life: Mix up; From all of the games, you can make your own stories, play with all the characters, etc. Thank u for reading my suggestions! Please consider them! I really love this game and I play it a lot (since I like using it for figuring out hairstyles for my original characters) and I like all the options, plus the Valentine's event was fun, but sometimes I'll be styling their hair and trying to be detailed and the person will move around so much that I keep messing up and I'll get too frustrated to keep playing. If there was any way to turn off/limit their movement and just keep their expressions moving instead that'd be cool! I love seeing them act so alive but if I'm actively holding down a tool or something then they shouldn't be moving that much. You guys upgraded everything I wanted and more! The braids and poofy hair were really creative! Very fun and very well thought! It's just, it would be fun if you could turn a big chunk of hair into one braid, apply makeup, have bigger chunkier curls, and possibly be able to see the person from the back as well. Zooming in and out would be very helpful too. And it's hard to make a hair style that looks like a ponytail or bun. But if you add a tool that will do that, try to make it so that you can choose the section of hair you want to turn into a ponytail/bun. I love but when I am trying to do there hair they keep on moving there head around making it hard to do it sometimes. Another thing is I wish we could see the back and be able to turn there heads around to see the back. And one more thing is it would be more fun if they gave us a idea of the hair style they want and if you would be able to choose if you want to do it how you want or how the costumer wants it. Please get a chance to read this. I love all the toca boca apps! But I have an idea for a really good toca boca app! It would be called toca life adventure And when you entered the app, it would have a world map and in some places you could have little areas to go to, like in Japan there would be like Japanese houses restaurants etc, places you could go to. Or you could have a area with a airport and only a airport and through the airport you could go to alll difrent places around the world like.. Africa, India, Japan, anywhere! I hope you put my idea to consideration. Ok, so I am definitely too old to be playing this but it is just so cute! I think anyone of any age can play. It is totally worth $2.99, buy this game, you will enjoy it more than you should, all of the little characters are so adorable and the animation is adorable! 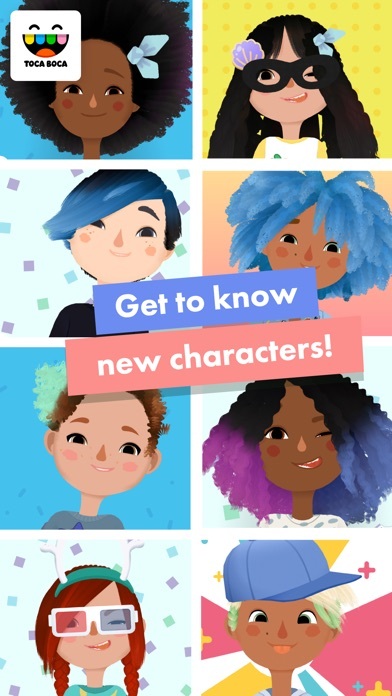 All of the characters have different personalities and different hair types. It lets kids have a lot of creative freedom, they can really do whatever they want. I am oddly obsessed with this game❤️ buy it! Buy all of the Toca bocas !!!!!!!! This is literally the most fun game to kill time and just play around! Definitely worth buying!! Maybe you guys could look into allowing us to save our masterpieces in some sort of gallery within the game, that we can revisit at anytime and play with or fix them! I also wish we would be able to turn the characters around (as highly demanded), as well as make the hair wavy (like beach waves not tight curls)! Thanks so much! Just like in the previous ones, Hair Salon 3’s hair mechanics(?) are kinda wonky. While I love the new theme, the new braiding option, and the fact that you can generate new clients at the push of a button, the actual styling of the hair is still kinda infuriating. I really with they would implement a way to rotate the character and style the back of the hair instead of guessing if you are styling the back correctly, only to find you you’re not. Not to mention how hard it is to cut the hair in the front and not cut the back and vice versa. A really good game but I would like this to be added! I really, really like this game. The overall idea of it super good! One thing that I would like to be added is a cashier section, the costumers would pay you on how well you did their haircut ! Also, there could be a request from the client and then you could attempt the cut! Thanks, I hope you can take those ideas in consideration!!! Hi Toca Boca! I'm here to give you suggestions for new and improved Toca Boca: Life games. Let's cut to the chase, I think some themes or settings of the game can be related to a Kingdom, like a royal monarchy. I might consider including magic and wizardry in this game, and mythical creatures. Some places I consider are the kingdom itself, guard training, servants house, a village, and some woods including possibly a camp site or orchard. Another suggestion is possibly a collage campus. A neat idea might have all the characters from Toca Boca: School grown up into collage students. Some recommendations include several classrooms, lunch room, a mall, lounge, cafe, and a couple of dorm rooms. Thank you for your time P.S: When is Toca Boca: Hospital gonna come out? Get. This. App. It's. So. Cute! This app is so fun! I have little competitions with my friends of who can make the best hair and it's so fun! I love it I love it so much! Get it, it's worth it! A few things in mind though, I wish there was more of a story behind each character, I also wish that you could save the pictures without saving it in your camera roll, but besides that, amazing game! 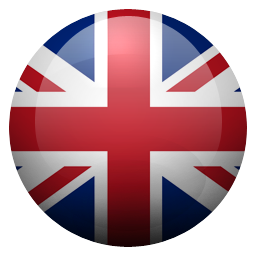 This is a great app. Unlike others, you don’t have to pay in game, just the normal $3 you normally have to spend. The app itself is great for kids, and teenagers alike. 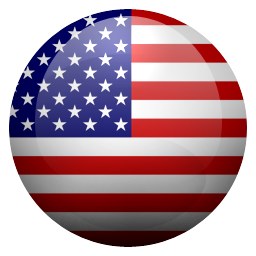 Made for ages 9-11, it isn’t sophisticated, but easy and simple to use. I highly suggest this highly for children who aren’t into complication things, or are creative, possibly even into cosmetology. Thanks for reading! See ya! I love this game! I play it almost every day. I have some suggestions though.... It’s so frustrating when the back of the customer’s hair is different from the front.... that’s why she or he should be able to turn around. And also, I wish the customers could give orders. But otherwise, this game rocks a five star. Need to be able to rotate the character!